Democrats are requesting that the FBI investigate EPA Administrator Scott Pruitt over reports that he tried to use taxpayer resources for his own financial gain. Pruit has been under fire for months, as multiple scandals have piled up regarding abuses of power and lavish spending. This week, reports have suggested he tried to secure a Chick-fil-A franchise for his wife. WASHINGTON – Democratic lawmakers are requesting that FBI Director Christopher Wray and acting Assistant Attorney General John Cronan open an investigation into Environmental Protection Agency Administrator Scott Pruitt, after a series of scandals showing a desire to boost his personal finances on the taxpayer dime. 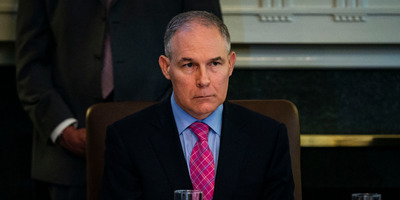 The letter outlines several allegations against Pruitt, including an attempt to secure a Chick-fil-A franchise for his wife, securing a job for his wife with a nonprofit group for a conference at which he spoke, and the use of a $US50-per-night condo in Washington rented from the wife of a lobbyist for industries regulated by the EPA. “We formally request that the FBI open an investigation into Administrator Scott Pruitt’s conduct to assess whether he broke the law, including criminal statutes prohibiting public corruption,” the letter concludes. Pruitt has been the subject of several scandals as of late. While lesser allegations and improprieties have resulted in cabinet-level firings during President Donald Trump’s administration, Pruitt has managed to stay in office. Pruitt is undertaking massive deregulations at the EPA, for which Republicans and the Trump administration have credited him and used as a reason for keeping him on board.